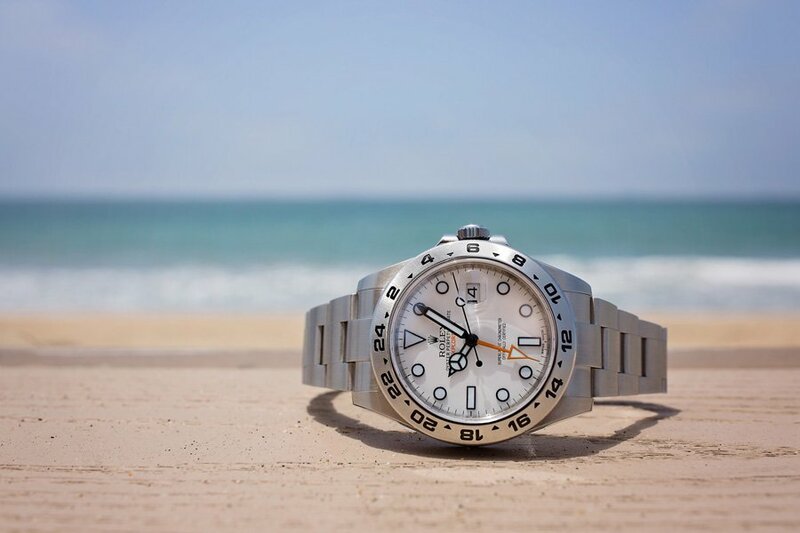 The Rolex Explorer Polar is the ultimate white-hot accessory to take you through the summer. The stainless steel body and bracelet gleam against that crisp white face and pop against tanned summer skin. But in all honesty, the Rolex Explorer II, nick-named for its striking white dial, will transition throughout the seasons. Besides that, it is an Explorer, after all. This sturdy, masculine timepiece is going to withstand incredible climates and the test of time with an Oyster case, high-visibility dial and luminous hands, 24-hour bezel, day and night tracker and self-winding mechanism. We’ll also note that Polar’s are exclusive to Explorer II’s, as the originals were only issued with the classic black dial. Now, let’s take a look at three of our favorites that we think would be wonderful additions to your collection. You might notice that the dial on this Rolex Explorer II Ref. 16550 isn’t exactly crisp white, it’s creamier. It’s technically a manufacturing flaw, but because these watches were only produced between 1985-1989, these Explorer’s are extremely rare and sought after. This watch was released in a short window between the ref. 1655 and the ref. 16570 with a 40mm stainless steel case and a face that was originally white. Over the years a paint flaw has turned it this creamy ivory color, giving it this unique look. We love how the hour markers also remained white, which makes them pop off of the dial even more. You should also take a close look at the face, as you can spot two other rare elements. First, check out how the letter ‘c’ in ‘Chronometer’ and ‘Certified’ line up perfectly above six o’clock. Then, peek at how the bezel — it’s thicker than the bezels Rolex’s issues today and are known as the ‘fat bezels.’ Needless to say, if you can get your hands on a ref. 16550, don’t pass up the opportunity to add it to your collection. Soon after the short-lived 16550 came the 16570 in 1989. Even though this is a vintage Rolex, the aesthetics have effortlessly transcended time. The 40mm bezel is outfitted with a waterproof Oystercase and clasp, scratch-resistant sapphire crystal, and an impressive 3185 automatic movement which was brand new at the time. This model is outfitted with a red 24-hour hand and that famously luminous face that’s easy to read in just about any condition. This vintage Rolex is going to sit handsomely on your wrist all summer long as you brave the heat and sip cool drinks. 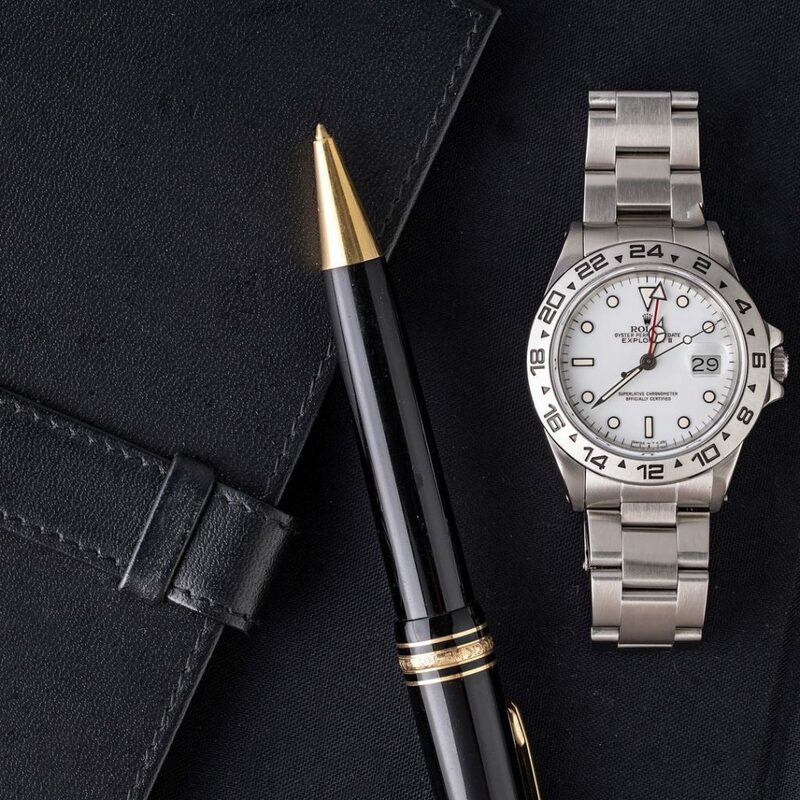 If you’re looking for a more modern Explorer II, the Rolex Explorer II ref. 216570 is going to be right up your alley. This 42mm watch is outfitted with modern features like a 3187 calibre and a striking orange 24-hour hand like the original, unlike the red featured on the ref. 16550 and ref. 16570. But besides the contemporary upgrades, the most striking feature of this timepiece is that brilliant white dial. The rare color alongside the famously striking looks of the Explorer II will effortlessly transition from a summer suit in the office to your swimsuit aboard the boat or lounging on the beach. 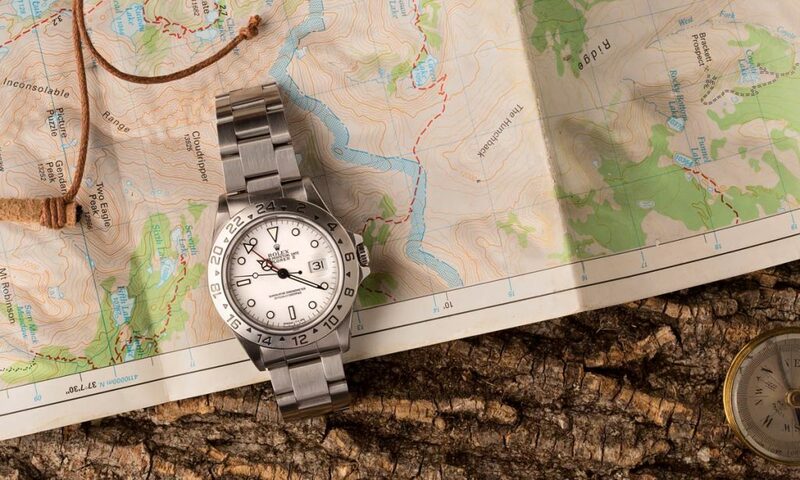 Shop Rolex Explorers here on Bob’s Watches.